Albert F. Little, son of druggist J.M. Little, establishes the Little Printing Company in Bradford, Ohio and engages in general job printing and in publishing the weekly Bradford Sentinel. The Little Printing Company moves to Covington, Ohio publishing the Covington Tribune Gazette until 1936 as well as continuing to publish the Bradford Sentinel until 1955. Russell K. Little continues the printing and publishing operations upon the death of his father. 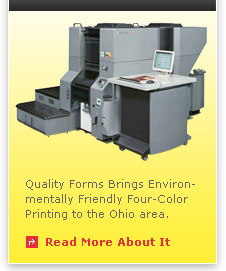 Dorrell S. Polhamus starts a printing service with equipment located in the basement of his home in Piqua, Ohio. Joel T. Phillips, a former employee of Little Printing Company, and Dorrell S. Polhamus join Russell K. Little as owners of Little Printing Company. Purchase is made of Bivens Printing Company, East Water Street, Piqua Ohio and it is renamed Piqua Printing Company. Entire ownership of Little Printing Company is acquired by Dorrell S. Polhamus and Joel T. Phillips after Russell K. Little’s death in 1954. A 40’ x 80’ building, the nucleus for future expansion, is erected at 4317 W. U.S. Rt. 36 to combine the Piqua and Covington operations. The name Piqua Printing Company is adopted. To accommodate the first business forms equipment, scheduled to arrive in 1966, a 40’ x 60’ addition is completed. The name Quality Forms is given to the new area of business. A second addition, 40’ x 140’, is erected and the entire plant is air conditioned. An 80’ x 100’ addition, plus loading dock, is the third expansion to provide room for presses, collators, bindery, shipping and storage required for the expanding business forms growth. Ground is broken for the 60’ x 85’ building for lunchroom, conference room and offices. Total building area is now 24,876 square feet. Expansion of production, preparation and camera facilities is made from vacated office area. Computerized photo composition equipment is added. With addition, total square footage is now over 56,000 square feet. Thomas E. Kinnison and L.J. Bertke, two employees with the company for a total of over 50 years experience, purchase the business. Annexation completed with City of Piqua allowing for the integration and upgrade of water and sewer services. Computer to plate equipment using laser imaging and chemistry-free plate technology is purchased. Riobi 34 DI 4 color Press is added into production that delivers extremely high quality four-color offset printing. A new logo is adopted to show Quality Forms' growth into commercial printing. Continued progress is the keynote of the future! Copyright © 2009 Quality Forms. All Rights Reserved.